Spring holidays offer a wealth of sales opportunities for Christian retailers. The most recent National Retail Federation study available on sales for these holidays found that Mother’s Day ranked only behind the winter holidays and “back to school” in spending totals for 2013-14, with numbers for Easter, Father’s Day and St. Patrick’s Day falling closely behind. So how can you make the most of your spring selling season? How can you give each occasion the unique attention it deserves and offer your customers the meaningful gifts they look for this time of year? It may be time to do some “spring cleaning”—to refresh your product offering, to spruce up your store displays, to give new life to how you reach your customers and promote your business. Flowers, cards and candy for mom, a necktie for dad—some gifts never go out of style. Although there’s nothing wrong with the “classics,” Christian retailers (to remain competitive) may need to think more broadly for these occasions. Jewelry is a traditional Mother’s Day gift that can benefit from a makeover. Pop necklaces or earrings inside of coffee mugs or keepsake boxes that feature mom-themed messages or designs. Gift-package the set so it’s especially convenient for gift-challenged guys and younger children. The popularity of cooking shows and celebrity chefs has made items for the kitchen go-to gifts appropriate for women and men. Pair bakeware, kitchen gadgets and grilling accessories with cookbooks of a complementary theme. Offer cookies, candies or coffees as a “free gift with purchase” to encourage sales of decorative dishes and coffee mugs. In-store events help to drive sales in the days leading up to these occasions and are a fun way to show your creative side. Consider “Shop with Mom” or “Day with Dad” events, and offer special incentives and activities on those days. Play music, offer free snacks and drinks, and give door prizes. Find a manicurist or massage therapist willing to volunteer their skills during select hours. Host an inspirational speaker or invite a local author to do a reading and sign books. Rent a photo booth or contract a photographer to take family photos and then offer your selection of photo frames at a reduced price. Help your customers pamper and celebrate their loved ones beyond just the gifts they share. Offer incentive pricing, such as BOGO deals, to increase your average purchase. Mother’s Day and Father’s Day aren’t just about moms and dads. Consider the in-laws, grandparents, stepparents, aunts and uncles who are often on customers’ gift lists too. Choose products with good margins and discount accordingly. Easter provides stores one of their best chances to sell spiritual gifts. The 40 days of Lent are often days of personal reflection. To serve this need, pocket tokens, prayer cards and faith-enrichment books are sought-after items. Families also often use this time to share the story of Christ’s resurrection with their youngest members. Meet this important need by stocking age-appropriate gifts such as resurrection eggs and illustrated story and activity books. Of course, the Easter basket is a staple of the occasion, so retailers should be certain to include an assortment of small items at lower price points. Bible-themed coloring books, stuffed animals, bracelets and cross necklaces are all good choices. If you don’t already carry seasonal candies, this season is a good time of year to add them to your shelves. Pre-fill baskets with a selection of these items for ready-made gifts. Although the sacrament season is most often associated with the first part of the calendar year, Christian retail stores are advised to carry gifts for these occasions all year. Baptisms and weddings are year-round events, and many churches celebrate First Communion and Confirmation on different schedules, so a permanent sacrament display is a necessity. During the spring months, shift focus to your permanent display by emphasizing the previous season’s best-selling items and including special signage that highlights the occasions. Be sure to refresh this area with new gifts throughout the year. St. Patrick’s Day has proved in recent years to be a strong gift-giving occasion—and one Christian retailers might overlook. The demographics of a gift shop’s location is, of course, a prime factor in determining how much space, energy and budget to allot for the occasion. But with recent census figures indicating more than 34 million Americans identify as either primarily or partially Irish, most stores should see at least moderate interest in Irish gifts. Celtic crosses, décor featuring home blessings and housewares items are increasingly popular ways to express one’s Irish heritage. Give these items a prominent location in the weeks leading to St. Patrick’s Day and then move them to a more permanent spot for at least six months to see if you can create a new, year-round seller. Remember to look for specials and incentives from vendors early in the year when purchasing for spring occasions. Vendors typically offer early-buy deals and will ship when product is needed. Try new products and vendors during this prime selling period. Bringing in a large quantity of new products all at once isn’t always financially feasible. Ask vendors to split shipping dates so fresh products arrive on a staggered schedule. This will give you new products to display every few weeks and provide time to move inventory before invoices are due. To encourage return visits to your store, direct your sales staff to tell customers that new items are frequently being added. Brick-and-mortar shops that maintain an e-commerce website have an easy, economical way to test-drive new products before bringing them into the store. Most vendors offer drop-ship services, allowing you to add as many items to your website as you wish without the commitment to physical inventory and hassle of order delivery. Your only significant investment is time. If you have the space to receive product early in store, use downtime to begin staging spring holiday displays. In addition to providing a clean, well-laid-out store, inviting and informative product displays are essential to drawing buyers. When constructing your spring products display, make sure new and best-selling items receive special attention and that signage is noticeable and easy to read. Group coordinating products together and direct your sales staff to upsell these items as a set or offer quantity discount pricing. Think beyond the holiday or occasion when planning your display. Spring is a vibrant time of year, so choose a color palette that reflects the season. 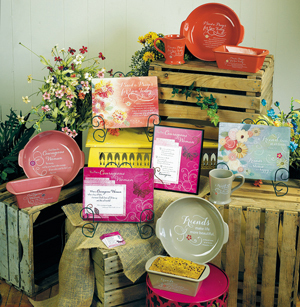 Add color-coordinated items from your “everyday” product offerings to accessorize and bulk up a Mother’s Day or Easter display. Create a spring “Staff Favorites” display from items selected by store employees and include signage to explain why these items were chosen. Your staff is your greatest asset in engaging the customer and securing sales, and a “Staff Favorites” display encourages interaction on a personal level. Depending on when your fiscal year begins and ends, spring may represent the beginning of a brand-new budget—or usher in a time of belt tightening after the expenses of the Christmas season. Spending on advertising is often the first to get cut when money is tight, so social media can provide an easy, economical way to promote your business and products and engage your customers. Facebook alone is host to more than 30 million active small-business pages. If your store isn’t already using Facebook, Twitter, YouTube, Pinterest or one of the many other social media platforms, you’re losing out on building customer awareness and possibly sales. There are seemingly endless ways to use these sites to promote your business and are most often free or low-cost. Post photos of new spring products as you add them to your shelves. Photograph unique combinations of products as gift suggestions and offer special pricing for customers who mention the post at checkout. Record and share videos demonstrating ways to fill an Easter basket or interesting gift-wrapping ideas. Use posts to get instant feedback from your followers about the kinds of items they want to see in your store. When planning your spring selling season, consider the season itself as inspiration. Spring is a time of rebirth and renewal. Use this time to remember what has worked for your store in the past, to let go of the products and practices that haven’t yielded positive results and to open your heart and mind to new and exciting ways to help your customers enrich their spring celebrations. Sue Kloeck is director of trade marketing for Abbey Press, a vendor in the retail channel for 52 years. In her 25 years with the company, Kloeck has also worked as a sales representative and tradeshow manager.